Spring is definitely here now, and everything is very busy at Bracken Hall Countryside Centre (BHCC). One of the most welcome signs of spring is the reappearance of the miner bees that choose to live under the BHCC paving slabs. When you visit us, please tread carefully as the bees are often to be found wandering around on the ground. If you treat them with respect, they'll not bother you. One of my favourite memories from last year was watching a toddler stood outside BHCC with miner bees gently buzzing around, and popping out of the cracks in the paving. The toddler had obviously not been influenced by our mostly irrational fear of bees, and the joy on his face was clear for all to see. The reality is that most species of bees are too small to sting us, and that nearly every one would rather just busy itself with its bee activities. 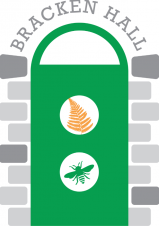 When you're walking on Brackenhall Green, Baildon Bank, and bits of the Moor, keep an eye open for the miner bees' tunnels – circular openings, often with piles of sand or earth around them. Sometimes you can observe battles between the bees and wasps – the latter trying to gain access to the goodies inside such as larvae and other food sources. Sat 13th: Macrophotography (i.e. close-up photography). Ruth Baumberg will share her love of the smaller parts of nature. She'll describe the techniques/equipment that she uses & share some of her glorious 'up close and personal' photos of local and European fauna & flora. Bring your own camera or smart phone, get inspired & have a go at taking macrophotographs of the Bracken Hall/Shipley Glen area. 12-4pm. Sat 20th: World Heritage Day 2019: Roberts Park Sundowner Event. BHCC will contribute to this special event, running from 5 to 9pm. There will be market stalls, street food, Easter Egg Hunt, Shakespeare Comedy Mashes, Guiseley Jazz Band and a Lantern Parade. Don't miss out! Sun 21st: Egg Decorating. Some hard boiled eggs will be available to decorate at BHCC. Regular volunteers and artists Susan and Val will be on hand to offer ideas and guidance. Come early – we ran out last year! 12-4pm. Wed 24th: Wild Wednesday. 2-4pm. Lots of family friendly activities will be available courtesy of the Friends of BHCC. Other Wild Wednesday dates for your diary are 29/5, 31/7, throughout August, and 30/10. Sat 27th: Guided walk: Birdsong in the Woods. Join Saltaire author Richard Smyth to explore birdsong in the woods in Shipley Glen. Richard is author of A Sweet, Wild Note – What we hear when the birds sing (2017). This event is run by Baildon Walkers are Welcome – meet the walk's leader, Bob Davidson, and Richard, at BHCC at 10am. Walk will finish by 12.30. Richard will help us to listen and learn about birdsong along the way. NB This is not a big hike – bring your children along for an end of Easter Holiday meander. Thursdays at 10am: HALE's Baildon Men's Shed. Get involved in woodwork with other men! No experience needed. Come along and help them with their biggest project to date – a shed built from scratch! Call James for info 07946 155347 or James.howgego@haleproject.org.uk.